A new decade dawned and Iron Maiden set about maintaining and developing their status as one of the world’s premier hard rock bands. The challenge would be tougher than anyone knew at the time. The 1990s had arrived. It’s been nearly 30 years since Adrian Smith left Iron Maiden and Janick Gers joined in his place. Nearly 30 years since Maiden entered the 1990s with a line-up change, a new album, and a new sound. Why did Maiden take a musical left turn after the success of Seventh Son Of A Seventh Son? Why did their first 1990s album sound so different when everyone in the band was happy with the final album of the 1980s? Why did Adrian Smith leave the band? How did Janick Gers come to join in his place? These and other questions will be discussed in this instalment of our series on the history of Iron Maiden, as parts of 5 major CHANGES that swept Maiden in 1990. The classic line-up of Iron Maiden point the way during their 1988 world tour: Harris, Murray, Dickinson, Smith, McBrain. 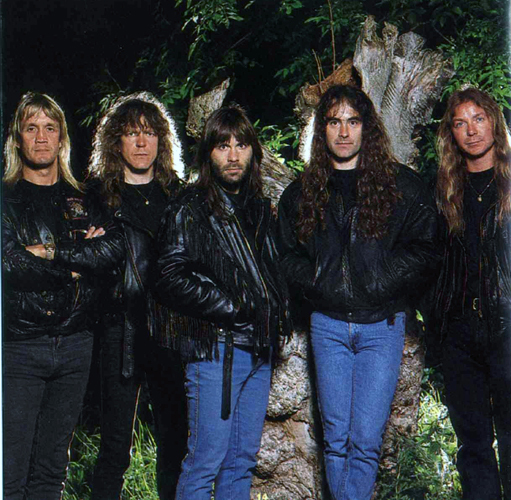 In late 1989 Iron Maiden gathered at the release party for the Maiden England concert video. 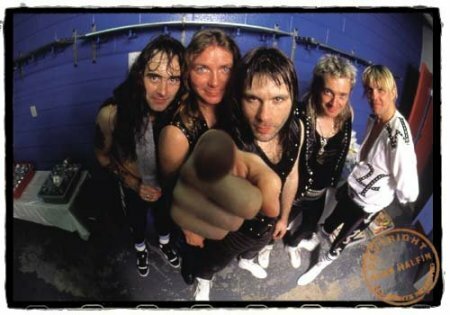 Celebrating the end of Maiden’s incredibly successful 1980s period, the video featured the band live on stage at the climax of the Seventh Tour Of A Seventh Tour, powering through a set of already classic metal material from their first seven studio albums. End of the Classic Era part 2, 1988-89. Iron Maiden at the end of their most triumphant decade, the 1980s. If anyone at the release party had any sense that Iron Maiden were about to enter a period of changes, they probably didn’t have a clue quite how massive those changes were going to be. At the time of the Maiden England release party in November 1989 Iron Maiden had enjoyed their first ever year off from band activity. Bassist and band chief Steve Harris had spent the first half of the year editing the new concert video, while two other members of the band had immersed themselves in adventures that were to impact Maiden’s development in ways that no one involved had originally intended. Guitarist Adrian Smith had spent his time off from Maiden forming the band ASAP (an acronym for Adrian Smith And Project). He had wanted to do something outside of Maiden for a while, and ASAP was built on the one-off side project Smith and drummer Nicko McBrain had put together in late 1985, named The Entire Population Of Hackney, designed to stave off boredom in the hiatus following the massive 1984-85 World Slavery Tour. The 1989 ASAP music that resulted from all this was definitely not derivative of Smith’s writing in Iron Maiden, but no one should have been too suprised to hear the guitarist take a different direction. 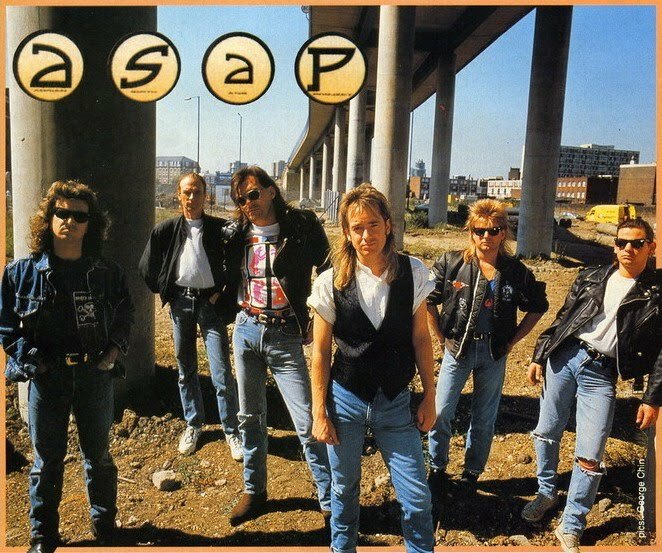 ASAP, the first Adrian Smith solo project, was a very serious and sombre affair, designed to impress America. Adrian had thoroughly enjoyed the experimentation of the previous two Maiden records, Somewhere In Time (1986) and Seventh Son Of A Seventh Son (1988), and the fact that Maiden picked up on stuff like Wasted Years and the eventual single B-sides Juanita, That Girl and Reach Out encouraged him to take his explorations further. In any case, Smith’s new diligence in working up non-Maiden tracks resulted in a batch of completed songs, the formation of the ASAP band, and the recording of Silver And Gold (1989) in London with producer Steven Stewart Short. The end of which decade…? Hair speaks a thousand words, as ASAP pose for their first and only album release. Maiden manager Rod Smallwood was enthusiastic about the material and the notion of Smith doing a solo album that would cater to his more ”commercial leanings”, as Rod put it, and maybe even provide a hit in America that would reflect well on Maiden. So it’s something of a paradox that when Silver And Gold was released in September 1989 it immediately tanked and quickly disappeared from view. 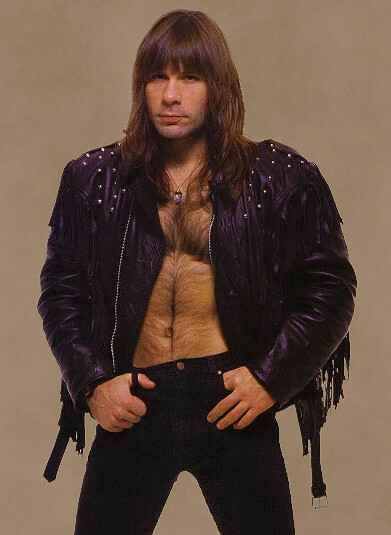 Not quite Axl Rose, but Bruce Dickinson entered the 1990s with style. Now he needed to write and record a song for the Elm Street soundtrack in a hurry. Bruce had to scramble. He cooked up a song and decided to call a mate that he was currently seeing quite frequently down the pub: Janick Gers, a guitar player formerly of White Spirit and Gillan who was down on his luck. Around this time Dickinson would hear Gers’ collaboration with former Marillion singer Fish, the track View From The Hill on Fish’s first solo record Vigil In A Wilderness Of Mirrors. The Maiden frontman thought to himself that “Fish is mad to loose this guy. He can really write as well as play.” What Fish threw away, Bruce could pick up and play with. After delivering his Janick-fueled debut solo song, Bring Your Daughter…To The Slaughter, the singer was happy to learn that Zomba loved the track and wanted more. Voilà, an album project! Dickinson threw Gers another lifeline and the two of them went about writing an entire album in one mad rush, working in Gers’ front room in London’s Hounslow suburb. They assembled a band and recorded the songs with producer Chris Tsangarides in Battery Studios in the summer of 1989. 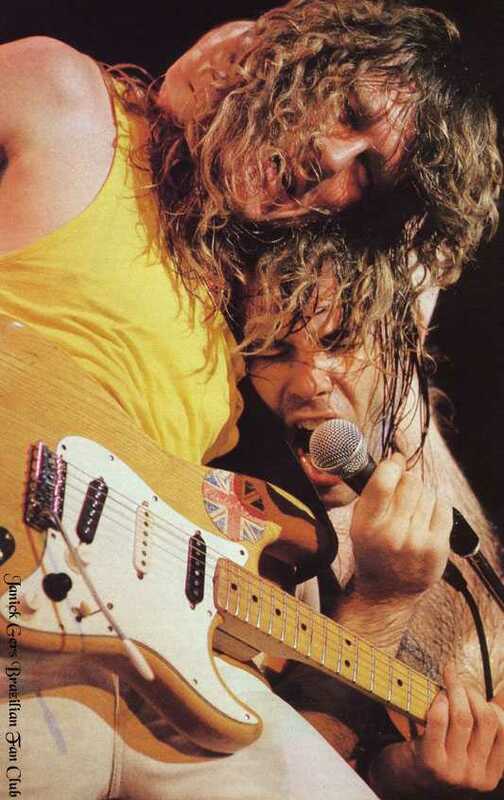 Janick Gers and Bruce Dickinson on stage in 1990. The resulting album was the pastiche-fest Tattooed Millionaire, released in the spring of 1990. Dickinson is clear in retrospect that it was never intended as anything more serious than a good time with mates, and absolutely not as a statement of artistic ambition beyond Maiden. Dickinson had not intended to fill his year off from Maiden with any kind of musical activity, prefering to focus on fencing and other interests. These ”other” interests had come to include authoring novels, a pastime he’d taken to a few years earlier on the Somewhere In Time tour. 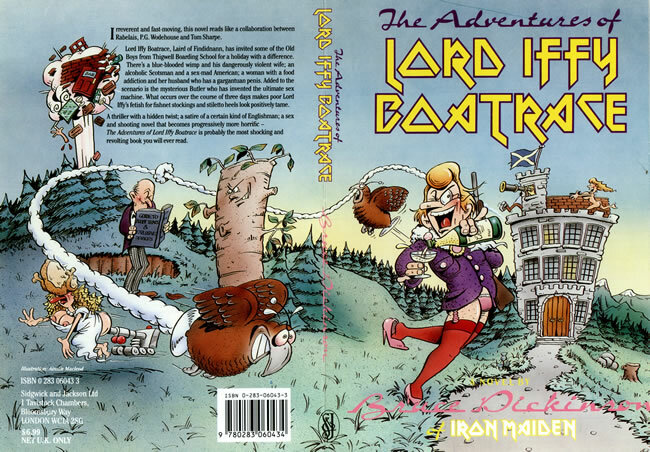 This eventually resulted in the publishing of The Adventures Of Lord Iffy Boatrace in 1990. As with his solo album, it was never designed as an alternative to continuing with Maiden. Bruce Dickinson’s satirical debut novel, featuring Lord Iffy, an upper class semi-transvestite land owner. 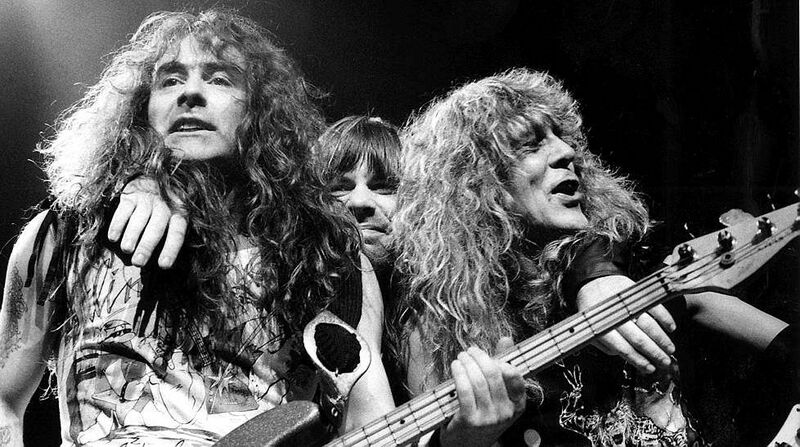 That sentiment would come back to haunt the bassist a few years later, but at the time Dickinson assured Harris that he was still 100 per cent into Maiden, and he insists to this day that he was very happy to return to his day job for their first 1990s adventure. 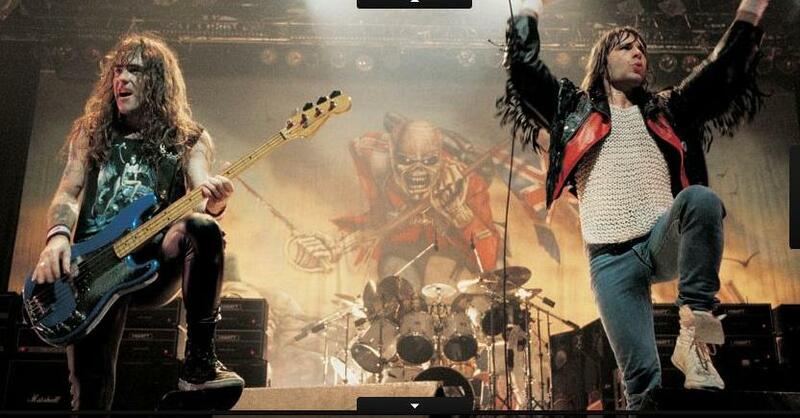 Iron Maiden set up shop at Harris’ Essex mansion in January 1990 to write their first album of the new decade. The plan was to take more time writing than they had done in the past (through January, February and March), and then start recording the new album at London’s Battery Studios in April. For Smith this was a very positive thing, as he felt strongly that more time for writing would be important to the band’s development. But Maiden’s songwriting had always been swift, and with the longest ever gap between albums to that point most of the band was extra geared up to get going. 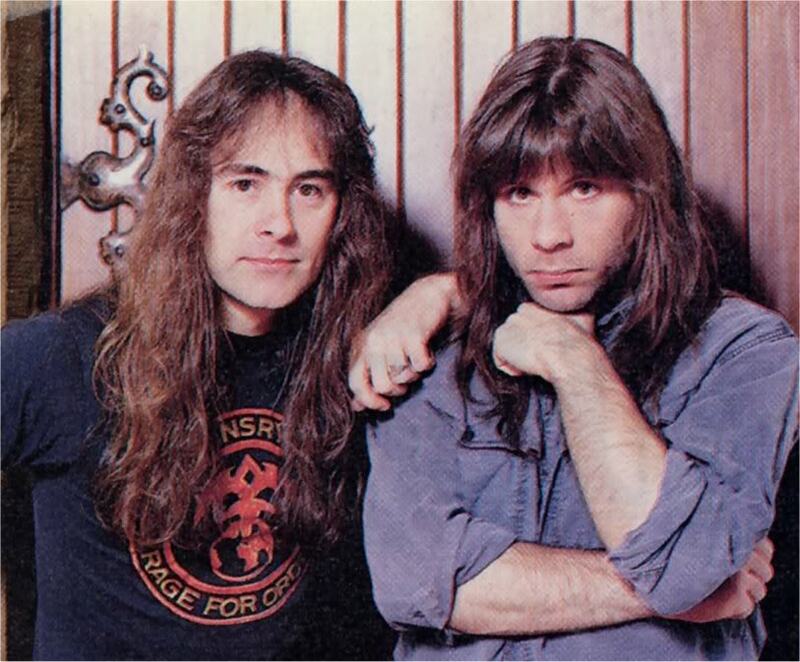 Harris and Dickinson got into frantic creative activity when they started work on Maiden’s first album of the 1990s. But the burst of creative energy between the singer and the bassist yielded CHANGE #1 – a stylistic shift, an intention to go back to basics, back to a street-level sound, making a kind of anti-Seventh Son album. Smith was taken aback by this left turn. 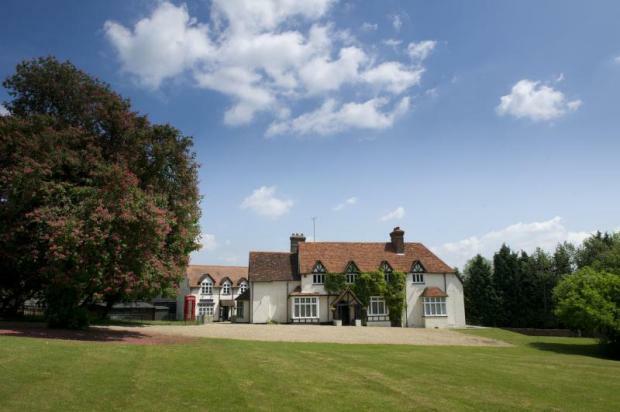 Steve Harris’ mansion in Essex had a barn on the premises that was converted into a rehearsal studio. Maiden’s first project there was the writing sessions for Seventh Son Of A Seventh Son. But with Harris and Dickinson in agreement about the direction of the music and the method of recording, there was very little Smith could do to alter the course of proceedings. The singer was fired up by the quick and energetic approach that resembled the way he had recently created his first solo album. Despite Smith’s misgivings, Birch and the Rolling Stones Mobile Studio were called in. According to Harris, the band had rehearsed four songs with Smith at that point – Hooks In You, Holy Smoke, Public Enema Number One, and The Assassin. Recording got underway, and Harris and McBrain put down the basic tracks for The Assassin. But within a matter of days a bombshell shook the band. CHANGE #1 led directly to CHANGE #2, the departure of Adrian Smith from Iron Maiden. The build-up to this point can be traced from the end of Maiden’s classic era, when Smith became unhappy with the exaggerated tempos of the band’s live performances. He clung to the wish and hope that their sophisticated late 1980s material could be given more room to breathe on stage, but now his love for that material was also being negated by the band’s new direction. 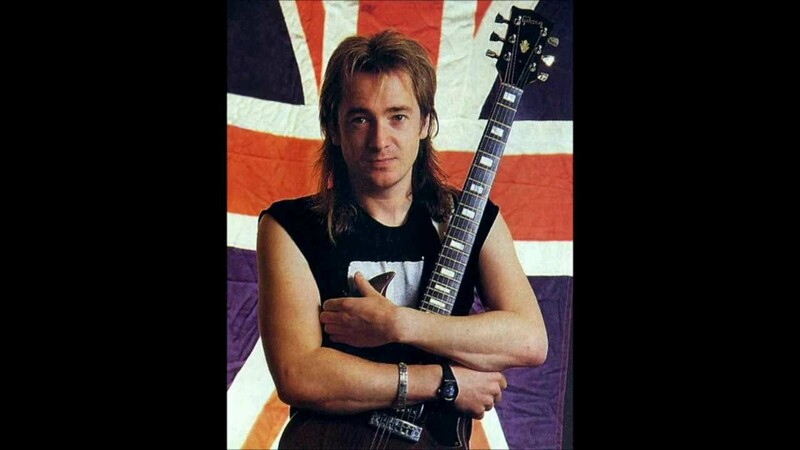 Adrian Smith was not a happy camper when Maiden decided to write a simpler back-to-basics album, ditching their late 80s aesthetic, and to record it as soon as possible on a mobile studio. Smith insisted he was still happy to contribute to Maiden, despite having enjoyed his solo project, but he was very unhappy that the new recording plan left him little chance to actually do so. Smith disagreed with the musical direction for the new album, wanting to continue down the road that had been travelled in 1986-88. At any rate he was put off by the change of plans that interrupted the writing process they had agreed to, and questioned the wisdom of a cheap mobile recording. He must also have been dreading a year on the road when he was unhappy with both the new direction and with the band’s live performances of the period. When Eddie was finally unleashed on the world anew in late 1990, here in the Derek Riggs artwork to first single Holy Smoke, Iron Maiden had gone through their first change of guitarists in nearly a decade. It was a reluctant parting of the ways that was pushed into effect by Harris, who probably believed that the most important thing was to keep Maiden’s energy going, not allowing the shark to stop moving. Dickinson later admitted that Smith ”wasn’t fired but he didn’t quit entirely willingly … He sort of agreed to leave.” Smith told Harris that he was 90 per cent into it, and the band chief replied that only 200 per cent would do. Smith yielded. Click here to read about all the “Maiden Exits”. From Doug Sampson to Blaze Bayley, here’s the how and why of all departing members! 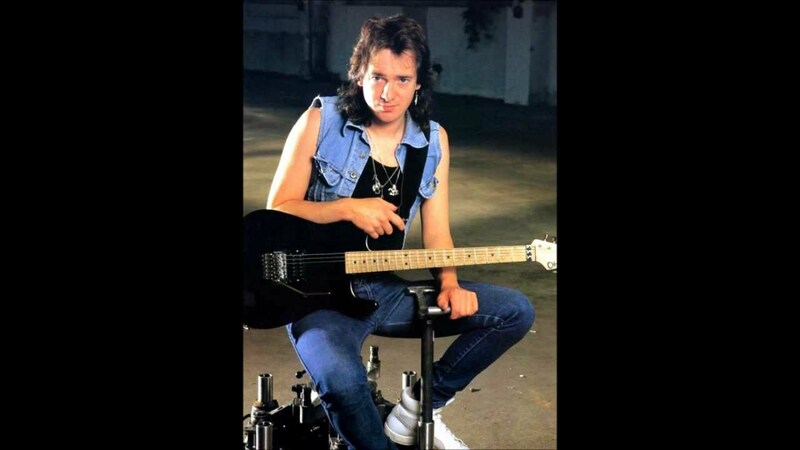 Adrian Smith in the late 1980s, happy to go down the road that Maiden chose with Somewhere In Time and Seventh Son Of A Seventh Son. It certainly became the default explanation at the time, in papers and magazines, but it wasn’t true. In any case, it was the end of the road for Smith with Maiden at a critical point in the band’s history. He was out. The severely amputated writing schedule threw things up in the air. Even if the band had wanted to get a real studio at that point, they probably couldn’t have done so on such short notice. In effect, Harris and Dickinson championed a last minute rethink of a carefully planned year of activity, and found themselves without a proper studio for recording and with one guitarist less to do the work. The inside of the Rolling Stones Mobile Studio that was used for the recording of Maiden’s 1990 album, cirka a decade prior. To solve problem number two, get Janick Gers! Harris thought the Tattooed Millionaire guitarist might be exactly the person Maiden needed: ”Good guitar player … Great onstage … Good bloke.” With no time to lose, Dickinson called Gers and asked him to learn The Trooper, Iron Maiden, The Prisoner and Children Of The Damned. Iron Maiden 1990: Gers, McBrain, Dickinson, Murray, Harris. Which suited the new Maiden ethos, didn’t it? 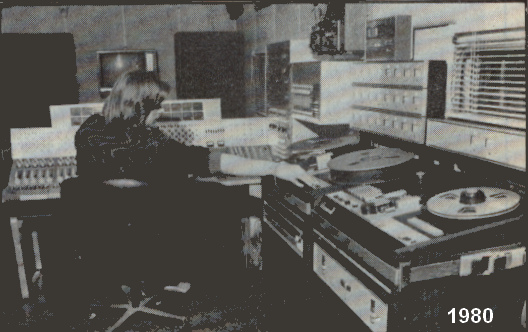 Birch worked his magic as best he could on the mobile unit and later mixed the album at Battery Studios. The first Maiden record of the new decade would be titled No Prayer For The Dying and released on October 1 in the fall of 1990. The band launched their new campaign by heading out on a UK tour of smaller venues, another one of the back-to-basics efforts of 1990. And indeed, the new-look and new-sound Maiden seemed to fit theaters better than they would arenas. In what might have been a natural reaction to the big productions of the 1980s they made CHANGE #4: Dropping the pyro and the elaborate sets in favor of Marshall stacks and simple lighting. 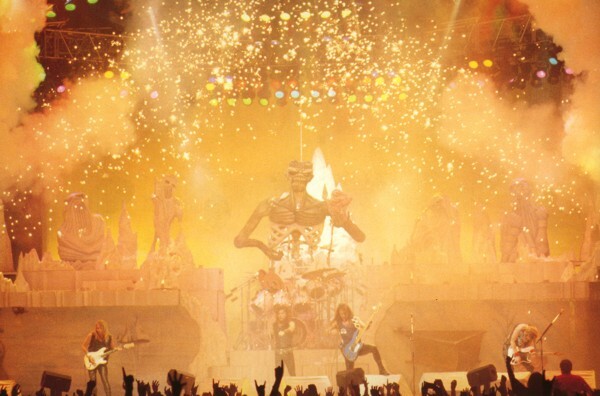 Iron Maiden on stage in 1990, featuring Eddie but staying away from thematic set designs and special effects. Click here for our look at Maiden’s 1990s stage productions! Maiden’s story, in short, is that they thought their late 80s stage shows were overblown and that they had seen the error of their ways. Quite simply, toning down was the right thing to do, artistically. However, could there be something else behind all this? Maiden are in the music business, after all. And what would be the business consequences of halving their US record sales and slicing their concert attendance too? In 1988, Maiden’s crew and production must have been as big as ever. But their US success was waning, with album sales down about 1 million units from the previous record. Tour attendance consequently shrank. Which would have greatly affected the ever important sales of merchandise. But why did Maiden make a considerable musical change from 1988 to 1990? The question is somewhat puzzling in light of how strongly the band felt about Seventh Son Of A Seventh Son. Harris is on record time and again saying it’s one of his absolute favorite Maiden albums, and Smith left the band partially because they abandoned that direction. 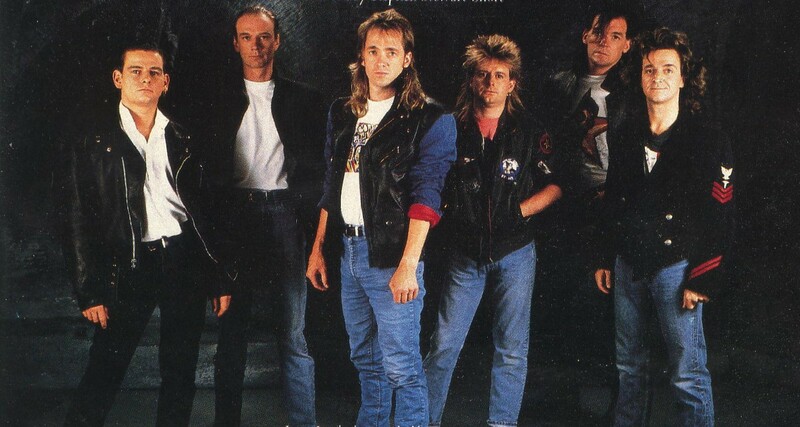 Dickinson was outspoken back in 1988, stating that ”with Seventh Son I think we’ve shown the way for heavy metal in the 1990s.” But in 1990 the Seventh Son style was exactly what the band tried to get away from, as they seemed to agree with music writers that they had gone wrong in 1988. 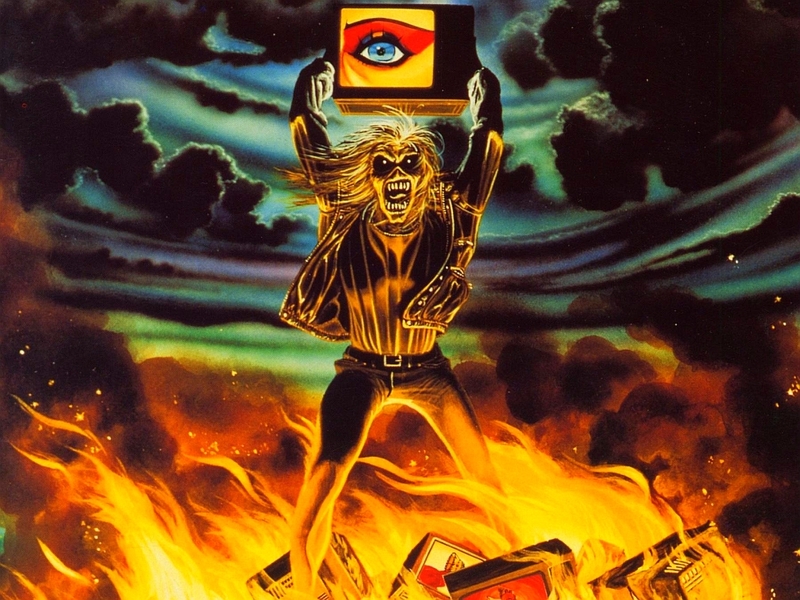 Were Iron Maiden really vindicated by having a number one single? Does this mean that Harris actually took to heart the decline in American sales, and that he bought into the tendency of some journalists to write off Maiden’s late 80s as “confused” and “clichéd”? It actually seems so. In which case the new album was at least a semi-conscious effort to regain their American cool. If the kids wanted more aggressive music, Maiden would be more aggressive. As Dickinson stated in retrospect, the notion was definitely to make a kind of anti-Seventh Son album, the very sentiment that put Smith off and out of the band. Harris claims that the new songs off No Prayer For The Dying went down really well live, but he admits to not being entirely happy with the album. CHANGE #5 was evident as Maiden hit the road to support No Prayer For The Dying, particularly in America in early 1991: A clear decline in interest, smaller audiences and smaller sales. Seventh Son had nearly halved the American sales of Somewhere In Time, and No Prayer halved it again compared to Seventh Son. Click here for a full live show from Maiden’s 1991 American tour, No Prayer On The Road! In other words, the change of musical direction did nothing to arrest Maiden’s falling star in America, and it merely maintained the status quo in the rest of the world. Harris would probably tell you that he never cared about sales, but wasn’t the change of style a direct response to the audience’s wishes and the journalists’ acid? Surely Maiden hoped to rectify something with No Prayer For The Dying, but failed to do so. It was a new decade, thrash metal was already big, with bands like Metallica and Slayer leading the charge. And the grunge wave was brewing, about to deliver a suckerpunch to the music scene with bands like Nirvana, Pearl Jam and Soundgarden. But could it not also be the case that many people simply found Maiden’s new music less interesting than the older stuff? In all honesty, does No Prayer For The Dying hold a candle to Powerslave (1984)? Was it the changing times that hurt Maiden, or did they fail to deliver the goods? Read on for the tale of Fear Of The Dark and Bruce Dickinson’s fateful exit from Iron Maiden! Sources: Kerrang! No 306 and No 307 (September 1990) and No 388 (April 1992), Metal Hammer No 20 vol 5 (September-October 1990) and No 8 vol 7 (August 1992), Stockholm, April 28 1996 (bookofhours.net, 1996), Run To The Hills – The Authorised Biography (2001), Classic Rock 33 (November 2001), The Guardian: “Rock by numbers” (May 2003), Bruce Dickinson – Flashing Metal With Iron Maiden And Flying Solo (2007) Kerrang! : “Maiden Heaven” (2014), What Does This Button Do? (Bruce Dickinson, 2017). Thanks, guys! It was interesting to research this one because the chronology of events is kind of unclear in the official bio. And I think it’s important to state and restate the reasons why Adrian left, to counter the myth that he didn’t want to do heavy metal at that point. How can you call No Prayer a heavier album than Seventh Son, which is the direction Adrian wanted to stick with…? Adrian was always the most avant-garde musician Maiden, long; Steve sailing between two waters, the classic hard rock and progressive rock of the early 70s, and Bruce follows the old school hard rock. Just listen songs like “22 Acacia Avenue” , “Flight of Icarus”, “2 Minutes to Midnight” or “Stranger in a strange land” to realize it. For me it was always clear that the reason for his departure was that Maiden did not continue in the line that had begun with “Somewhere in Time”, out of exhaustion from touring. If Adrian had not gone in 1989 Maiden possibly have done very great albums … If you think about it, It’s terrible. I always thought that the reason Adrian Smith left was precisely the musical direction after SSOASS, besides the fatigue of touring. What would have happened if Maiden continue to SSOASS in line? Tremendous if one thinks . Janick joined Maiden in January 1990, so this phone conversation was a few months before the eventual TM tour in the summer. But this is the first time I hear that they did anything Maiden other than Bring Your Daughter on that tour. Are you sure? lol — Are you surprised that Bruce would change his mind? However, I came over an interesting thing when checking the double date at the Astoria in London prior to the US tour. One of the nights claim to have The Trooper as the last encore. I have a vague memory of reading somewhere that some of the Iron Maiden members joined Bruce on stage in London and did The Trooper. Could be a one of. I think Bruce and his band played “Flight of Icarus” and “Run to the hills” when Adrian Smith joined to him; but in the “Tattooed Millionaire Tour” Bruce and Janick played “Bring your daugther to the slaughter” and “The Trooper”. The Trooper? Are you sure? Absolutely sure; 27th june 1990, in the Astoria Theatre, in London. It was the only time they played this song in the Tattooed Millionaire Tour. Ms. Ray, could your memory be playing tricks on you? As far as I know, the only Maiden song played by Bruce and Janick on that tour, apart from ‘Bring your daughter…to the slaughter’ (originally a solo song back then), was ‘The Trooper’ in London, as an encore with the rest of the Maiden boys. Really? Do you think I would forget the night I spent an hour and a half enjoying the company of one of my heroes the week after my birthday? LOL! Believe me, Poughkeepsie, New York was nearly felled by the thrill in that little sardine-packed venue. No, I’m not surprised about Bruce or anyone changing their mind. I had just never heard about them doing anything Maiden except Bring You Daughter on that tour. Just curious. To be honest, I don’t think Bruce would have survived the backlash if he didn’t do *something* classic, especially in the US and at that juncture of his career. He may not have wanted to do any Maiden, but inevitably, it was a good business decision, I think. (Aside from majickal, of course!) Besides, Rod was there that night, so there may have been pressure, who knows? Still, it seems that everything Maiden except Daughter/Slaughter was a one-off on that tour. They did a pretty good job of staying away from it, bearing in mind that they really only had about 40 minutes of music to pick from. @Adrian: Cool, a one-off then, as Torgrim said. When it comes to Flight Of Icarus, could you be thinking about Bruce and Adrian in 1997, Ms. Ray, like Ghost suggests? Should I take all these “are you sure” questions personally? Because it’s starting to get offensive, boys. That would be taking it the wrong way. You’re simply in the company of self-confessed Maiden nerds, and it doesn’t seem anyone here has ever come across this information before, Janick performing Icarus in 1990, that’s all. In any case this means that something is wrong with the information on that Poughkeepsie 1990 bootleg recording that Ghost linked to. I think comments should not be taken as negative or personal. Everyone can make mistakes, and really It is a fact that Bruce just played “Flight of Icarus” and “Run to the hills” when Adrian joined him in the middle of 90s, and It`s also a fact that Bruce only made “The Trooper ” only once, in London, in 1990. From there I think the error is assumed and go. I was at the TM London gig, last night of the UK leg, where the rest of Maiden came on after the final encore to do The Trooper. The lights stayed down after the regular encore (Black Night? ), and it was like an electric charge through the audience as we realised Nicko had climbed onto the drum stool. Steve and the rest walked on and they charged through The Trooper. The best bit was seeing Davey rocking out and moving like he hadn’t for years. Either Metal Hammer or Kerrang ran an interview with Jan afterwards where he said he’d have loved to play more Maiden numbers, but Trooper was the only one they’d rehearsed. So, here are many words to the gallery. There’s no topic about Fear Of The Dark itself yet !!! I have one interesting question : in booklet we can see all maiden boys on the ruins of some medieval castle…where’s it? What castle? No idea about what castle they used. It’ll be very interesting to read about The X Factor too. That’s cool! Also, 2015 is the 20th anniversary of X Factor! Give it at least some arcticle this year (now it’s almost a month to date of 20th date release!). Well, of course, but I see this site’s alive and quite often posting new articles news, and ect. ect… and…well, there will be NOT JUST A SINGLE(!) article about TXF for it 20th anniversary?!!! Unwelcome here? Why? We don’t have to like something to write about it, Maiden Revelations is about all things Maiden. When it comes to these in-depth features about Maiden history, we just started at the beginning, in this feature, and we’ll keep going forward at the right occasions. Don’t have time for everything. Thanks a lot for all the infos your website is incredible ! The seventh son album was the finale for maiden. They should have ended their journey. 27 years later still rocking to the 7 wonderful albums they gave us. Iron Maiden ruled the 80’s. long live the 80’s!